By admin at Nov. 14. 2011. Occasionally, even after many years of gardening, growing hundreds if not thousands of plants, one comes across something that is so different that it is a challenge to identify it. At the bottom of the page is a picture of a plant that I picked up in State College in August. It had no tag and the garden center manager, who was also intrigued by the plant, could not remember the name of the specimen but said it was a tropical related to the shrimp plant. Since shrimp plant is Justica brandgeana, a search of the genus eventually came up with Justica carnea ‘Alba’, which appeared to be the unknown. According to Edward F. Gilman, professor, Environmental Horticulture Department; University of Florida, Justica carnea comes in a wide range of colors including white, pink, apricot, yellow, and lavender. The only one readily available, other than the white, is the pink form Justica carnea ‘Radiant’. The pink variety seems to be more widespread than the white. 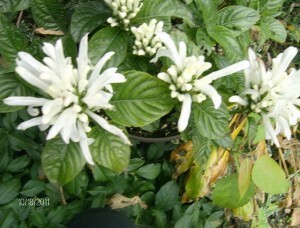 The common name for the plant is Brazilian plume flower, jacobinia or flamingo flower. It is a native of Brazil and South America, so in zone 5 it is grown as a house plant. It is also frequently put in the ground or large pots and treated as an annual. Jacobinia was a star in Victorian conservatories in the early part of the 19th century. In zones 9-11 it is used a foundation or garden plant for shaded areas. In zones 8 or 9 it may freeze to the ground but will come back from the roots in the spring. If the plant persists through the winter it is an evergreen and retains its leaves. As a shrub, it can reach a height of 6 feet and an equal width. There are smaller varieties that mound and are about 2feet tall. Even the larger specimens that are kept in pots do not reach their full potential. The flowering stems should be pruned back lightly to shape the plant and to encourage flowering. The flowers form on new wood so pruning can be done all summer. While heavy rains may overburden larger specimens and pull the branches to the ground this is not l a problem in our northern gardens where the plants are unlikely to reach maximum height. The unusual tube shaped flowers appear in spurts 2 to 4 times per year. Between these bursts of blossoms the plant will put out fewer blooms but can continue to bloom throughout the entire summer into fall. Deadheading will keep the plant blooming. Even as a pot plant jacobinia prefers part shade, although in northern areas it will take slightly more sun. In the ground the plant prefers rich well drained soil but will grow in sand, loam or clay. The pH range should be from acidic to slightly alkaline. In a pot it should be kept well watered, as it is not drought tolerant. Fertilize in the spring, summer and early fall. This plant is fairly hardy and will take a certain amount of neglect. Mine was subjected to more sun than it liked and dryer conditions than it was happy with during the summer months. Moving it into shadier, more protected location and with cooler temperatures it has resumed growth and is now in full bloom. On October 16 it is still outdoors, although we have not had a freeze or even a really hard frost yet. Jacobinia is said to root easily from cuttings. All but the top growth should be removed from a 7-8 inch stem. The bottom of the cutting is placed in a sterile medium and should be kept moist until new leaves appear. Cuttings are available for the next several months or until I kill it, whichever comes first. Jacobinia is not readily available in our area. It is also difficult to find in catalogues. The only catalogue that seems to carry it is Willow Creek Gardens at www.willowcreekgardens.com. They have the pink ‘Radiance’. It is, however available from a small Florida nursery, Funny Farm Herbs, that sells on eBay. They have the pink, white and yellow varieties. The yellow one is Justica aure, a different species, and a very large plant indeed, reportedly growing to 8 feet.